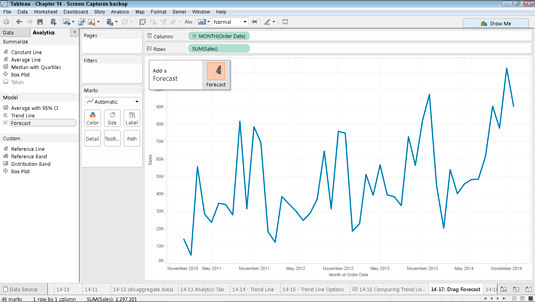 Tableau lets you use forecasting for your visualizations. Forecasting is a means of predicting what will happen in the future based on historical data. Even though forecasting can be, to some extent, guesswork, most businesses use forecasting to help predict where the market will head. In Tableau, forecasts are based on sophisticated models that look at the trends in the past to help predict future results. 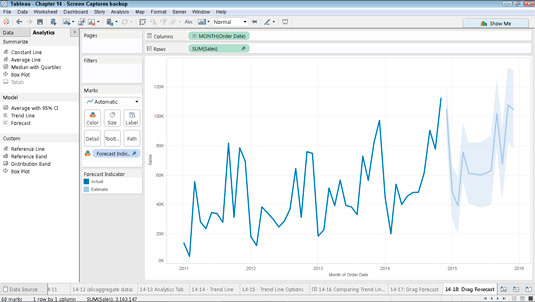 Tableau uses a technique known as exponential smoothing where recent results have more weight than older results. When preparing a forecast, Tableau compares the results of up to eight different forecasting models to see which produces the highest quality results. Don’t worry though; Tableau will make the best selection based on your data in the view, but the forecasts can always be edited. The methods used are discussed in detail in the Tableau help. 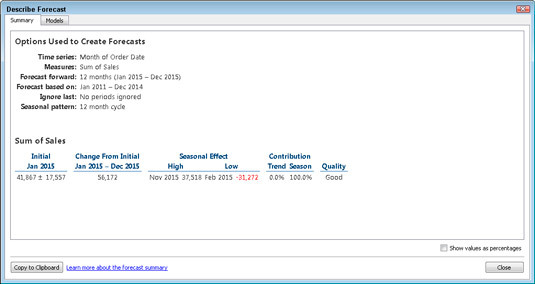 Forecasting projects results using time series data, so keep in mind that you can only use forecasting in Tableau if your analysis includes a date and at least one measure. There are scenarios that will not allow for forecasting, such as when using disaggregated data, totals, and table calculations. Open a new workbook using a data source that contains both date values and numeric values. For this example, the Tableau Superstore sample is a good choice. Drag the Sales Measure onto the Rows shelf. Drag the Order Date dimension onto the Columns shelf. Click the down arrow at the right side of the Order Date dimension on the Columns shelf to display the context menu and choose a continuous date option. 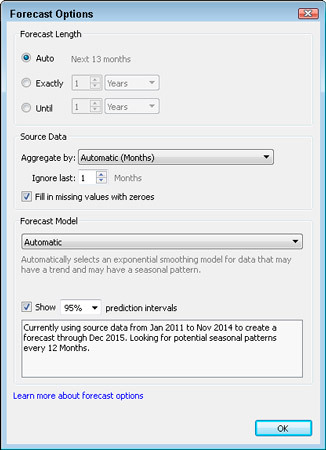 In this case, choose the option to display the continuous month, shown as Month May 2015. Click the Analytics tab in the Data pane to display the analytics options. Select Forecast and drag it onto the view. Dragging Forecast onto the view. Examine the chart to see how the sales are forecast to continue based upon the existing data. The sales forecast is based upon trends in the existing data. 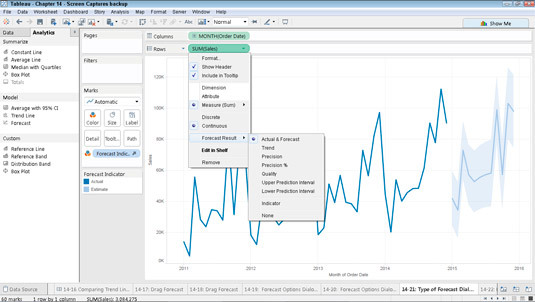 Choose Analysis → Forecast → Forecast Options from the Tableau main menu. Doing so calls up the Forecast Options dialog box. Choosing the options you want to modify the forecast. Using the dialog box, choose any options you want to use to modify the forecast. For example, you could use the options in the Forecast Length section to create a longer-term forecast. When Tableau creates a forecast, it is not sure of when the last time period has completed. As a result, it defaults to throwing away the measure value from the last time period, which in this case is December 2014. In this scenario, you can assume that the year is complete, so you will want to include December in our Actual Data and begin our forecast in January 2015. In order to do that, just choose 0 Months in the Ignore Last … Months drop-down menu in the Forecast Options dialog box. Your forecast will now begin in January 2015. Changing Forecast Options to begin forecast in January 2015. Forecasts are exactly that — forecasts, not assurances. Choosing a forecast length that’s too long can greatly increase the probability that the forecast will contain large errors. Choosing the type of forecast result to display. To see additional information about how the forecast was created, right-click the view and choose Forecast → Describe Forecast from the contextual menu that appears. Doing so displays the Describe Forecast dialog box. Viewing additional information about the forecast. You can’t change any of the information in the Describe Forecast dialog box, but if you want to save the information for documentation purposes, click the Copy to Clipboard button. You’ll then be able to paste that information into another document.